Zoe McGinty, who died suddenly in September after she inexplicably contracted meningococcal disease (W strain), with her mum Kirsten McGinty. IT BEGAN like any other Saturday. Single mum Kirsten McGinty was doing loads of washing after a busy week at work. Her three teenage kids were mucking around on their laptops and eldest child, Zoe, a fitness fanatic, had just returned from the gym. The petite 20-year-old, her long blonde hair piled high in a bun, was sitting at the kitchen bench eating pancakes and berries. Shortly after 10, on that mild September morning last year in Hendra in Brisbane's inner north, Zoe told her mum she felt tired and was going to have a shower and lie down for a while. Sixteen hours later she was dead. 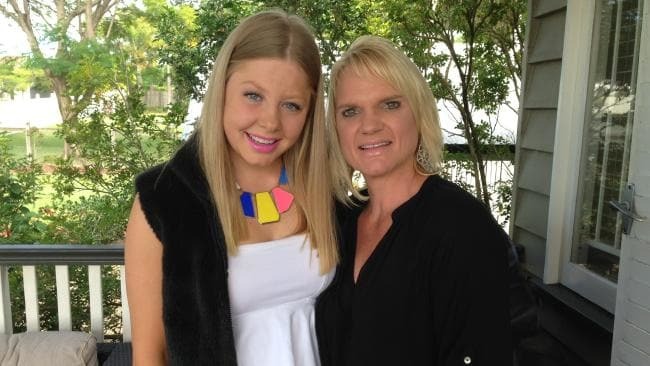 The third-year QUT Media and Communications ­student had inexplicably contracted meningococcal disease (W strain), although it would take a week for her grieving family to learn her cause of death. In the blur of days that followed Zoe's shock passing, Kirsten struggled to comprehend what had happened. One cruel phrase kept playing in her head: healthy at breakfast, dead by dinner. Unlike many other Australians who contract meningococcal - an infection that occurs when bacteria, typically transferred through kissing, coughing or sneezing, invades the body - Zoe had no telltale rash of red and purple ­blotches. Her mother, as any parent might, assumed her daughter, who'd started to vomit after showering, had a stomach bug and that she'd be back to her bubbly self the next morning. "All my children have had gastro bugs over the years, and Zoe's were the same symptoms; nothing about her ­triggered me to go, 'Oh, this could be serious'," says Kirsten, 47. "I knew she was sick but didn't think it would be fatal." "I always worried about her speeding around in her beat-up old black Citroen, but I never worried about meningococcal. "I'd heard of it but certainly would never have considered getting a vaccination, and most people wouldn't." Kirsten is on a mission to change that, with a fire in her belly as fierce as her love for Zoe. As the newly appointed Queensland representative of Meningococcal Australia, the former public servant is ­lobbying the federal and state governments to offer free vaccines to all Australians to protect against the five known strains of the disease in this country. It is an ambitious task. While the Federal Government relies on the Pharmaceutical Benefits Advisory Committee to determine if a vaccine should go on the National Immun­isation Schedule, state governments have the power to act independently. But the vaccines aren't cheap and pharmaceutical giants set high profit margins. As it stands, Australian infants are entitled to receive a single, free vaccination against the A, C, W and Y strains. In Queensland, a program offering jabs to 15 to 19-year-olds - ­instigated last year after a spike in W cases - will finish in December. Vaccinations of Year 10 students will continue until the end of 2021. For everyone else, the quad-­vaccination costs about $75. Immunisation against the most prevalent strain, B, ­however, is not funded nationally or in Queensland for any age group and costs upwards of $250. Only South Australia has an age-progressive plan ­targeting B, at a cost of $24.5 million. Alarmingly, deaths from meningococcal have more than doubled in Australia, with 28 in 2017, up from 11 in 2016 and 12 in 2015. This is not just a young person's disease. Last year almost 400 Australians were afflicted, and if meningococcal doesn't kill, it often maims, with survivors losing limbs, fingers, and brain or kidney function. So far this year, Queensland Health data reports 27 cases - 13 of B, six of Y, 5 of W and three pending classification. In 2016, ­before the quad-vaccination program was extended to teenagers, there were 45 cases - 17 of B and 13 each of Y and W.
"Clearly, this data proves that vaccination works," says Kirsten, who previously ran grant programs for start-ups in the state Department of Science, Information Technology and Innovation. "There are so many illnesses and cancers out there and people raising money for research, but for me, this is simple. There is a problem. We have a solution. It's not like we have to do decades of research to come up with vaccines. We've got them. "How many parents have to bury their children, how many families have to be torn apart?" Mourners spilled out of St Agatha's Catholic Church in inner-north Clayfield at Zoe's funeral service on September 15, 2017. More than 650 people attended, grieving with a family still in shock. Zoe's younger sister Bridget, then 17, and identical twins Ben and Zac, who'd turned 14 three days earlier, were ­distraught. 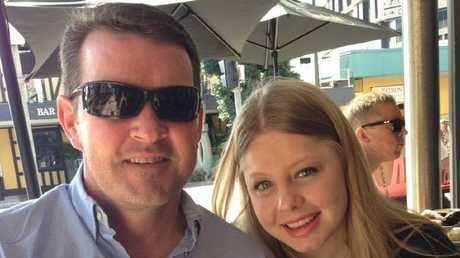 Her father, Shaun McGinty, a 46-year-old ­financial ­trader from whom Kirsten separated in 2012 after 16 years of marriage, delivered the eulogy as people wept. Kirsten read a poem that began with, "you can shed tears that she is gone or you can smile because she has lived". Zoe, who attended St Agatha's Catholic primary school and later St Rita's College, was a popular student, a star water polo player and, as her mum puts it, "an icon at ­Brumby's", the Clayfield bakery where she'd worked part-time since age 14. She was a friend to everyone, Kirsten says, and ­mistakenly believed she was a good singer. "In the car she would just start singing so loudly and turn to the kids and me and say, 'Wow, that was great, wasn't it? ', and it was terrible and we would all laugh. "Her smile lit up the room." Zoe was considering a career in the community care ­sector, having enjoyed an internship in the marketing unit of Ozcare, a not-for-profit organisation helping the aged, disabled, homeless and drug-addled. 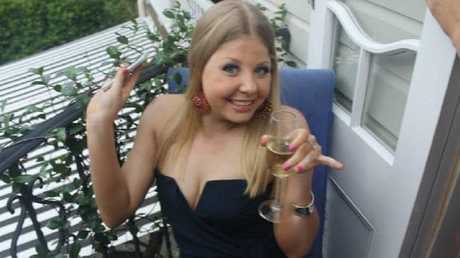 She was a regular at inner-north Lutwyche gym Fitness First with her long-term boyfriend, electrician Simon Taylor, 25. Zoe's death, eight weeks before her 21st birthday, was a bitter end for someone who'd been a fighter all her life. "She was born with craniosynostosis, which is premature fusion of the bones in your head," Kirsten says. "She had two massive operations, at eight weeks and six months. Doctors totally remodelled her skull - she wouldn't have been able to function otherwise." After her parents separated, the then 15-year-old ­became "a rock" for her mum as the family home in ­Clayfield was sold and they moved into rental accommod­ation in the ­adjoining suburb of Hendra. "Zoe was always really great to me and to the kids," ­Kirsten says. "She said to me one day not long before she passed, 'Oh Mum, I can tell you anything, it's just like ­having a really good friend'. "We are both early risers, and we'd sit out on the deck with a cup of tea and just talk about anything. She'd say, 'I love this time of the day, I just love it, Mum'. "And now, when I see the sun coming up, I think of her." 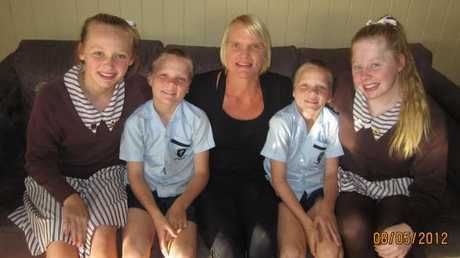 Zoe McGinty with her mother Kirsten and and siblings Ben, Zac and Bridget in 2012. For months after Zoe died, local residents delivered hot meals and groceries and helped around the McGinty home. The support from the community, where ­Kirsten had also grown up and her mother before her, was overwhelming. Kirsten, nee Austin, was raised in nearby Ascot in a grand colonial home her mother Leonie McKenzie inher­ited soon after her marriage to Brian Austin, a civil engineer who rose through the ranks of the Liberal Party to become state health minister in the early 1980s. Austin switched to the National Party in 1983, enabling then-premier Joh ­Bjelke-Petersen to form government, and six years later retired from office after being implicated in the Fitzgerald Inquiry and convicted of misappropriating $8700 of public funds. The middle of three daughters, Kirsten was studying for an arts degree at the University of New England in Armidale, NSW, at the time. 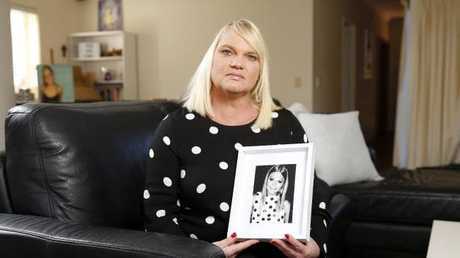 "It was a tough period, horrific actually … it was a ridiculous witch hunt but someone had to be made a scapegoat," says Kirsten, adding: "My brother Trent died of cot death [sudden infant death syndrome] at three months, so it hasn't been easy for Mum or Dad." The Austins - Leonie is 74 and Brian 75 - now live in ­riverside Teneriffe and continue to struggle with the death of Zoe, their first grandchild, who lies in Pinnaroo Cemetery at Bridgeman Downs, northern Brisbane, three rows apart from Trent. "My parents are devastated because they know what it feels like to lose a child," says Kirsten, "and they said recently, 'we never thought we'd have to share this experience with our own daughter'. "It's weird how things come into your head - I'll see ­people who are pregnant or getting married and think, oh wow, I'm never ever going to see that with Zoe. That's hard, and especially because she went through such a terrible start to her life. To pull through and become this amazing person, it seems kind of cruel. "And it's cruel for Ben, Zac and Bridget - they've lost their sister, so many memories they will never have a chance to make together." Zoe McGinty with her father, Shaun McGinty. The terrible turn of events on September 2, 2017, ­continues to haunt Kirsten, who worries she could have done more to save her precious daughter. "You go through, like any mother would, enormous anguish - what if I'd read more about meningococcal? - but even Zoe kept telling me she was fine." After breakfast, when Zoe said she was tired, Kirsten wasn't surprised. Her daughter had worked a full week at the bakery, been studying, and had gone out the night ­before with Simon and his parents. "Zoe and Bridget's rooms are downstairs and they ­message me from there … that's really embarrassing," ­Kirsten smiles. "Anyway, not long after Zoe had her shower she texted me, 'Mum, I feel really sick', so I went down. "She looked absolutely normal, in her pink and white flannelette pyjamas and pink T-shirt, and then she started to vomit. She did that a few times and around lunchtime she got diarrhoea. "But, you know, I wouldn't take my child to a doctor if she'd been vomiting for a few hours, why would you? ­During the course of the day, either I or Bridget would be with her, then she settled down a bit in the afternoon. "Around 6pm I was upstairs making dinner and went to check on her, and she said she felt like she wanted to faint, so I called a nurse friend nearby and asked if she had any Stemetil to stop the dizziness and vomiting. "Over I went and grabbed it. In the meantime, Zoe had been texting Simon to say she couldn't get out of bed, and he also offered to take her to the doctor but she kept saying she'd had these things before and not to worry." Kirsten fed her other children, and the boys, who had their club rugby union grand final the next morning, went to bed about 8.30pm. Later that evening, Bridget came ­bolting up the stairs. "She was frantic, saying, 'Mum, something's really wrong with Zoe, she's trying to get to the toilet but she can't feel her legs, she can't get up'." Kirsten called the ambulance. It was just before midnight. Paramedics arrived within minutes. Zoe had a very high temperature, a blood sugar level so low it couldn't be recorded, and was blue around the lips. Her voice had slowed, like she'd had a stroke, Kirsten says, but she was still lucid and responding to questions. "I know now that septicaemia, blood poisoning from the bacteria, had started and every part of her was shutting down. She was holding out her hand and saying, 'Mummy, don't leave me, don't leave me', so I knew that she was not right, and she hasn't called me mummy for 10 years. "They were working on her in her bedroom and, this sounds stupid, but I looked around and there was mess everywhere, undies on the floor, and I was thinking, oh, Zoe, couldn't you have cleaned your room?" Rapidly, Zoe became unconscious and went into cardiac arrest. 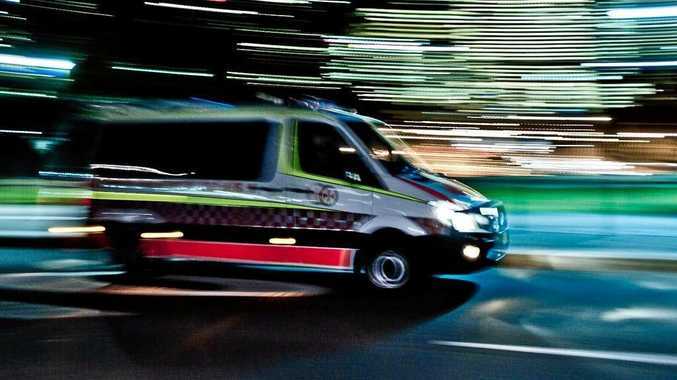 A critical care paramedic unit was called and Zoe was in cardiac arrest for more than 20 minutes before they could get vital signs and stabilise her enough to transport her to the Royal Brisbane and Women's Hospital. "I think they did all they could," says Kirsten, "but no one called it as meningococcal because Zoe did not present with those hideous big red blotchy rashes most people get." In the emergency ward, Zoe was worked on by a team of doctors and nurses while her parents waited nearby. "I was touching Zoe, and willing her to take a breath and open her eyes, but then everything went quiet and the ­machines were turned off." It was just after 2am on Sunday, September 3. Kirsten and Shaun returned to Hendra to break the ­tragic news to Bridget. At about 5.30am, after Kirsten's ­parents and Zoe's boyfriend Simon had arrived, the boys were woken. They burst into tears. Remarkably, Ben and Zac went on to play, and win, their grand final match for Brothers at Ballymore a few hours later, their under-14s team wearing black armbands. A week passed before the hospital notified the family that Zoe had died of meningococcal W.
"No parent should ever have to pick out an outfit for their child to wear in a coffin," says Kirsten, who buried Zoe in her favourite bronze-coloured silk jumpsuit, with Tiffany & Co heart earrings her grandparents had given her. Almost 11 months after Zoe's passing, Kirsten is busier than ever. In a new job, as executive officer for Youngcare, which helps young people with high-care needs find age-appropriate homes, she is also campaigning to ­protect all Australians from the disease that stole her Zoe. 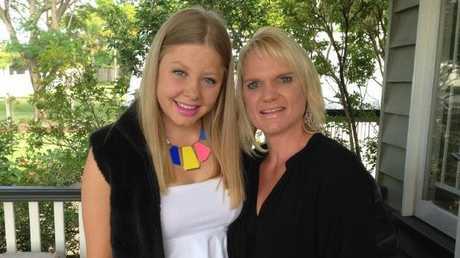 Eliza Ault-Connell, the director of Meningococcal ­Australia and a survivor of the B strain disease, says Kirsten is an inspiration. "For families like Kirsten's, the reality is heartbreaking," says Ault-Connell, a 36-year-old mother of three and 2018 Commonwealth Games wheelchair marathon silver medallist. She contracted the disease at age 16 and had her legs amputated below the knee. She also lost her fingers. "Each case of meningococcal is different, as are the outcomes, but because we're not seeing thousands of cases, it can be hard for the government to spend $100 million on vaccines - however, if we don't act now, this is what we could have. We are already seeing a huge spike in the ­number of cases. Pharmaceutical companies need to come to the party and negotiate on price." Ault-Connell says it is the speed of meningococcal that makes it so terrifying. "Lives can be taken in a matter of hours. I look around at beautiful kids missing arms and legs and think, like me, they're the lucky ones." Kirsten McGinty is bravely moving forward and trying to rebuild. She has resettled the family in a new rental home in Clayfield - "no one could go downstairs after Zoe passed" - and is leading a campaign titled #goforzo, urging people to "go for Zoe and get vaccinated" against all five strains of meningococcal. She is also finalising an awareness program to take to 3000 Queensland schools and, with an army of friends, has organised a sold-out fundraising lunch at Blackbird ­Restaurant in Brisbane next Friday. Zoe McGinty, who died suddenly in September after she contracted meningococcal disease (W strain), with her mum Kirsten McGinty. There are other events, including a community walk for Zoe in October, and Kirsten continues to meet with Federal Member for Brisbane, Trevor Evans, and Federal Health Minister Greg Hunt. She has written to the state Health Minister, Steven Miles, and has received a reply saying his office will "be in touch". "I won't stop until our governments do more to save lives and protect people from being maimed, and the ongoing suffering and costs associated with that," Kirsten says. "This disease is preventable. We have the cure. "No family should have to go through what we have. Every life is precious."